In September, Washington Post columnist Dana Milbank wrote a click-baiter about how Donald Trump was killing him. Literally. “I went for my annual physical last month, and, for the first time in my 49 years, I had to report that I’ve not been feeling well: fatigue, headaches, poor sleep, even some occasional chest pain. My doctor checked my blood pressure, which had always been normal before: alarmingly high! “At this point, I arrived at a self-diagnosis: I was suffering from Trump Hypertensive Unexplained Disorder, or THUD. This past month has been especially challenging, beginning with Hurricanes Irma and Jose but not ending with a slate of special legislative elections and political developments. — Orlando attorney/entrepreneur John Morgan is inching closer to a run for governor, curtailing his use of F-bombs as he continues a “speaking tour,” because “listening tours” are “so much BS,” he says. — Northwest Florida Congressman Matt Gaetz finally took himself out of water-cooler contention for Attorney General in 2018, coming out to endorse fellow Republican and former judge Ashley Moody. — Former Republican State Rep. Mike Hill of Pensacola has opened a campaign account to try to return to the House in 2018. Hill was first elected to the House in 2013 but ran unsuccessfully for the Senate last year. He now plans to run in Escambia County’s House District 1. — The card is set for the special election in House District 72, and four candidates have qualified in the race to replace former Rep. Alex Miller, who left the House Sept. 1. Republican James Buchanan, Libertarian Alison Foxall and Democrats Margaret Good and Ruta Jouniari made the cut. — A race has developed for Orange County Mayor, one of the premier jobs in the state. Most recently, Rob Panepinto — board president of Orlando Inc., the regional Chamber of Commerce — announced his candidacy, joining Orange County Sheriff Jerry Demings, Robert Melanson and Jose Colom. Orange County Commissioner Pete Clarke also announced his candidacy but has not yet filed to run. Hopefully, my blood pressure will stay healthy enough for me to cover all of these — and many other — stories. — @MarcoRubio: The idea that over 20 American Embassy personnel could be severely injured in Cuba & the Cuban govt. not know about it is ridiculous. — @MikeMadden: There is no truck drivers’ strike in Puerto Rico, despite what the president just told the press pool. — @KionneMcGhee: Just returned from Puerto Rico. For local level not to have lights/water/food, they should be commended for helping communities stay together. — @Springsteen: Down here on E Street, we’re devastated and heartbroken over the death of Tom Petty. Our hearts go out to his family and bandmates. — @JoeReedy: This is first #Miami–#FSU game since 1983 where the U has been ranked and FSU has not. “Pam Bondi, staff go to Nevada to aid victims” via Jim Turner and Tom Urban of the News Service of Florida — Bondi, along with Emery Gainey, director of the Division of Victim Services and Criminal Justice Programs, and five advocates are traveling at the request of Nevada Attorney General Adam Paul Laxalt. The Florida officials hope to use what they learned following the 2016 Pulse nightclub killings in Orlando to help in the aftermath of a mass shooting Sunday night that left at least 59 people dead in Las Vegas. “Sadly, (in) Florida we know what we’re doing after the Pulse nightclub,” Bondi said before an afternoon flight to Las Vegas. Bondi said the situation in Las Vegas is similar to the Pulse shooting in that many victims of the Orlando massacre or their family members weren’t from Florida. Pam Bondi is traveling to Las Vegas at the request of Nevada Attorney General Adam Paul Laxalt to assist victims of the Mandalay Bay mass shooting Sunday night. “Floridians’ consumer confidence shaken by hurricanes” via the Tampa Bay Times — Consumer confidence among Floridians dropped in September as unease over short-term economic conditions rose sharply, according to the University of Florida’s monthly consumer sentiment index … The index fell six-tenths of a point in September to 95.5 from a revised figure of 96.1 in August. Of the five components that make up the index, three decreased and two increased. Expectations of personal finances a year from now showed the biggest drop this month, down 4.4 points from 104.8 to 100.4. Similarly, there was a decline in expectations of U.S. economic conditions over the next year, falling from 95.8 to 93.2. Expectations of U.S. economic conditions over the next five years, however, rose 3.7 points from 89.6 to 93.3. Assignment editors — Gov. Rick Scott will join state and local officials to give a 10:30 a.m. update on Hurricane Irma recovery efforts at the Key West Marriott Beachside Hotel, 3841 N. Roosevelt Blvd. in Key West. At 2:30 p.m., the governor will tour JAXPORT Blount Island Marine Terminal, 9620 Dave Rawls Blvd. in Jacksonville. 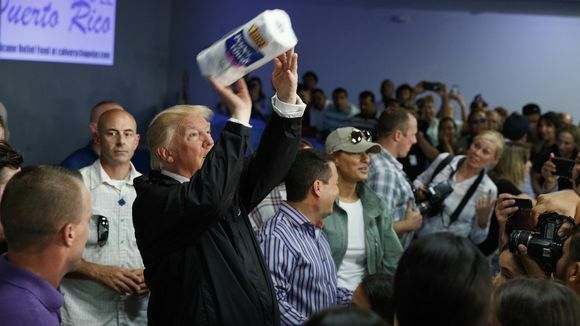 Donald Trump tosses paper towels into a crowd as he hands out supplies at Calvary Chapel in Guaynabo, Puerto Rico. Photo via AP. 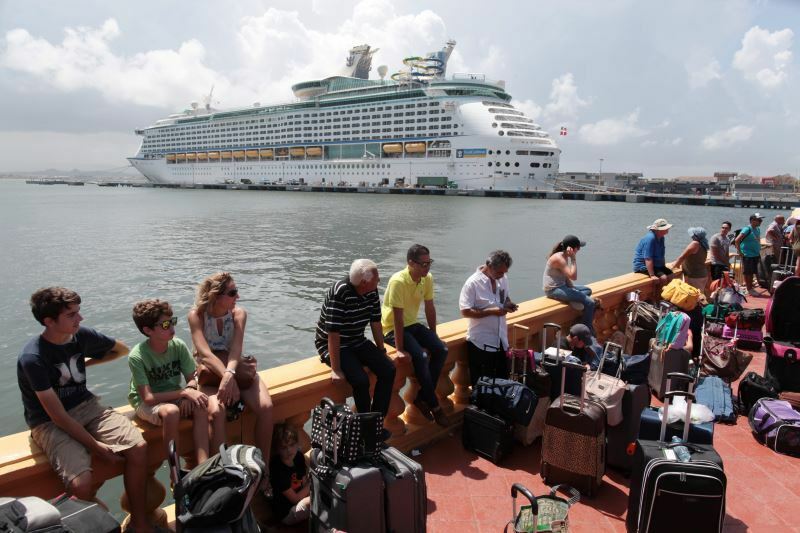 “Cruise ship carries thousands of hurricane evacuees to Fort Lauderdale” via Chabeli Herrera of the Miami Herald — Following the devastation Hurricane Maria wreaked in Puerto Rico on Sept. 20, Royal Caribbean International canceled Adventure of the Seas’ Sept. 23 voyage and instead sent the ship on a three-stop humanitarian tour. Last Thursday, Adventure sailed from San Juan with 1,791 evacuees to pick 864 more in St. Croix and 681 people in St. Thomas before heading back to Fort Lauderdale. The voyage, free of charge to evacuees, was part of an unprecedented effort cruise lines had made this hurricane season to bring relief to the islands they typically visit year-round. “We try to help as many people as we possibly could and I think, in nearly all circumstances, pretty much everybody that showed up we took on board and we helped them,” said Michael Bayley, president and CEO of Royal Caribbean International. The Miami-based cruise line also delivered about 900,000 cases of food, water, medical supplies and other relief supplies. Bayley said that long-term, Royal Caribbean plans to offer volunteer opportunities for free to employees or guests who want to help in cleanup efforts on the islands hit by Irma or Maria. Puerto Rican evacuees line up to board a Royal Caribbean cruise ship that will take them to the United States. Photo via Reuters. “Stranded in Puerto Rico after Hurricane Maria, infants flown to Miami for heart surgery” via Daniel Chang of the Miami Herald – It was the aftermath that nearly killed them — and the serendipity of professional networking that rescued the three newborns from the storm-wracked island, and brought them to Miami’s Nicklaus Children’s Hospital for emergency heart surgeries within 48 hours of the hurricane’s landfall in Puerto Rico. Without the surgeries, Amelia Pieve Silvagnoli, Gabriellyz Troche Ruiz and Liam Javi Nieves would have died from the heart defects with which they were born, doctors said. The infants are among dozens of Puerto Ricans who have come to South Florida for medical care in the aftermath of Hurricane Maria, which devastated the island’s health care system. About 90 patients evacuated from Puerto Rico and the Virgin Islands are receiving kidney dialysis at Florida International University in Southwest Miami-Dade under a hurricane recovery response program coordinated by the state’s Department of Health. “After Puerto Rico trip, Florida Democrats strike nonpartisan tone” via Matt Dixon of POLITICO Florida — In a lengthy statement after a trip to the island with Democratic National Committee Chairman Tom Perez, the Florida Democratic Party released a lengthy rundown of the visit devoid of partisan sniping. “We all need to help however we can, and I’m hopeful this trip by our lawmakers will bring important perspective and urgency to our state Legislature when it considers what action our state should take to support our fellow Americans in Puerto Rico,” said FDP Chairman Stephen Bittel. The Florida elected officials on the trip were state Sen. Victor Torres, state Sen. Annette Taddeo, House Democratic Leader Janet Cruz, incoming Democratic leader Kionne McGhee, state Rep. Amy Mercado, state Rep. John Cortes, state Rep. Carlos Guillermo Smith, and state Rep. Daisy Baez, and Greenacres Mayor Joel Flores. The one-day supply trip was focused on the City of Ponce and surrounding areas. “Utility regulators plan hurricane prep, restoration review” via Florida Politics — The Public Service Commission, which regulates investor-owned utilities, on Tuesday set into motion its plan “to review electric utility hurricane preparedness and restoration actions during the 2017 hurricane season,” the panel said in a news release. “The review will explore the potential to further minimize infrastructure damage that results in outages,” the statement said. Chairman Julie Brown had announced the plan last month … “This extensive data collection and detailed analysis will include a workshop on hurricane preparedness with input from all electric utilities and stakeholders, including customers. Upon the conclusion of data collection and analysis, and consideration of public comment, the Commission will consider options for immediate action,” the release said. “After Las Vegas, Chris King condemns inaction on gun laws, calls for action” via Scott Powers of Florida Politics — King responded to the Las Vegas massacre by lashing out at “Florida’s one-party government” for not pursuing gun law changes after the Pulse nightclub massacre, saying it is time for action. “We can pray for the victims and their families, but that alone won’t stop it from happening again,” King stated in a news release and on social media. “There are many people who are angry, myself included, with the nonstop incidences of gun violence in America.” King charged that Florida lawmakers failed to implement proposals for universal background checks for gun purchases, limits on the size of firearms magazines and ending the prohibition on studies of gun violence after the shooting at Pulse June 12, 2016 — which killed 49 and wounded 53. He also noted the lack of spending on mental health services, which he said ranks 50th nationally. Who wouldn’t want to party with David Simmons at a Bruno Mars concert? “Chip LaMarca running for state House, won’t seek re-election to Broward County Commission” via Anthony Man of the South Florida Sun-Sentinel — He hopes to succeed state Rep. George Moraitis, who can’t run for re-election next year because of term limits. The 93rd State House district, in northeast Broward along the coast, is the one area of the county in which Republicans have been able to continue winning elections even as the county, as a whole, trends more Democratic. The district’s registered voters are 34.8 percent Democrats, 36.2 percent Republicans and 29 percent independent/no party affiliation. LaMarca is a former Lighthouse Point commissioner and former chairman of the Broward Republican Party. He’s in his second term on the County Commission. Moraitis is the only Republican who lives in overwhelmingly Democratic Broward who serves in the state Legislature. If he isn’t succeeded by a Republican, there won’t be anyone who lives in the state’s second-largest county who serves in the majority party in Tallahassee, though a few Republican-held districts in Miami-Dade County include small parts of South Broward. “DeBartolos give boost to new Hillsborough sheriff’s political committee” via Matt Dixon of Florida Politics — A political committee boosted by a familiar football family has been formed to support recently sworn-in Hillsborough County Sheriff Chad Chronister. The committee — Law Enforcement for Responsible Government — was created Aug. 14, two weeks before Gov. Scott appointed Chronister interim sheriff after the retirement of David Gee. The biggest early contributions are from members of the DeBartolo family. 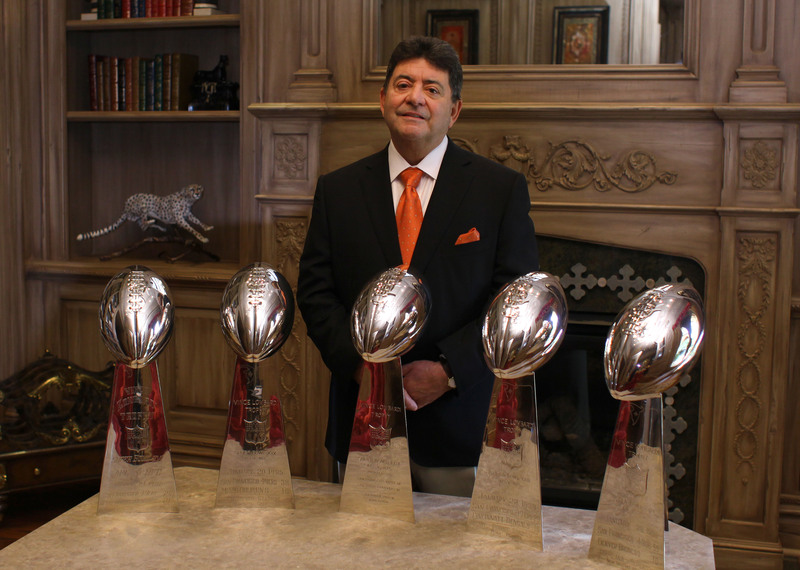 Eddie DeBartolo, who has given the committee $25,000, is best known for owning the San Francisco 49ers when the team won five Super Bowls. The developer moved to the Tampa Bay area in the late 1990s. Chronister, a registered Republican, married DeBartolo’s daughter, Nikki DeBartolo, in 2010. Eddie DeBartolo, best known as the owner of the San Francisco 49ers, gave $25,000 to the political committee of his son-in-law, newly sworn-in Hillsborough County Sheriff Chad Chronister. “Nonprofit consultant Rob Panepinto announces run for Orange County mayor” via Stephen Lemongello of the Orlando Sentinel — Panepinto, a Republican, joins Republican School Board Chair Bill Sublette and Democratic Sheriff Jerry Demings in the officially nonpartisan race … Panepinto, 50, is president of the Winter Park consulting firm Florentine Strategies and CEO of Entrepreneurs in Action, which helps nonprofits generate revenue. The group also is a partner in the Central Florida Social Enterprise Accelerator, which provides mentorship and funding for nonprofits. He sits on several civic and nonprofit boards, serving as chair of Orlando, Inc. and the Central Florida Foundation. He’s also a board member at the nonprofit Orlando workspace Canvs, the nonprofit seed capital group FireSpring Fund and the Rollins College Center for Advanced Entrepreneurship. Panepinto said diversifying the economy, teaching people how to build businesses and working to develop accessible housing were key for the growing county. “Newest St. Pete Polls survey shows — surprise — Rick Baker leading Rick Kriseman” via Florida Politics — … although statistically-speaking, the race is a virtual tie. Baker received 46.0 percent of those surveyed while Kriseman garnered 45.3 percent. Just under 9 percent of voters are unsure about who they support. Breaking down the numbers, it would appear Kriseman is now firmly in command of the black vote, leading that demographic 46 to 38 percent. For much of the primary, Kriseman trailed Baker among black voters. But the recent controversy about President Trump’s remarks in response to a white nationalist rally in Charlottesville, Virginia — and Baker’s refusal to say whether he had voted for Trump — have almost definitely hurt the Republican candidate … Baker’s support from the black community also may be undercut by an endorsement former President Barack Obama gave to Kriseman … There’s an interesting phenomenon happening in the male/female numbers. Kriseman is leading Baker among men, while the former mayor is leading the incumbent among women. The leads are not huge — just four or five points in each case — but they defy traditional assumptions about men identifying with the more conservative candidate and women rallying to the Democratic-leaning candidate. “CRC panel focused on constitutional rights starts narrowing focus” via Matt Dixon of POLITICO Florida — A Constitution Revision Commission panel tasked with reviewing proposed amendments … has received nearly 170 public proposals, many of which are duplicates. Chairwoman Lisa Carlton said the panel would use that list to narrow its focus in future meetings … topics of future meetings include proposals to repeal the Alien Land Law, an obsolete provision in the Constitution that bans undocumented immigrants from owning land. A push to repeal the Blaine Amendment, a provision in many state constitutions that prohibits direct government aid to schools with religious affiliations. The committee has also gotten 21 proposals related to personal privacy, and several others that deal broadly with victim’s rights. “Richard Corcoran demands information from Visit Orlando” via Gabrielle Russon of the Orlando Sentinel — Richard Corcoran sent a letter to Visit Orlando, demanding the release of a sponsorship deal with WOFL-Fox 35 and other contracts that might have a conflict of interest with the group’s board members … Visit Orlando receives money from a 6 percent tax on hotel rooms in Orange County but has declined to say how much it has spent on some of its deals. The House Speaker asked the agency to release details on a deal for a Fox 35 weather camera on top of the Hyatt Regency Orlando. “As you know, representatives of both WOFL-TV Fox 35 Orlando and the Hyatt Regency Orlando sit on the Visit Orlando Board of Directors,” Corcoran wrote to Visit Orlando’s Chief Financial Officer Larry Henrichs. “Such an arrangement might be seen as a conflict of interest, and your refusal to release more information might be viewed as an attempt to conceal impropriety and evade public scrutiny.” Corcoran also asked Visit Orlando to document any other public money that was spent on businesses with ties to the group’s board members. “Jason Brodeur files ‘fantasy sports’ bill for 2018” via Jim Rosica of Florida Politics — Rep. Brodeur has again filed legislation to exempt fantasy sports play from state gambling regulation. The Sanford Republican filed his measure (HB 223) on Tuesday. His proposal comes less than a week after Sen. Dana Young filed her own fantasy sports bill (SB 374) for the 2018 Legislative Session. He filed a similar bill last session. The latest Brodeur bill says fantasy contests are “not subject to regulation by the Department of Business and Professional Regulation and not subject to” the state’s gambling laws. Moreover, “all winning outcomes reflect the relative knowledge and skill of the participants,” the bill adds. 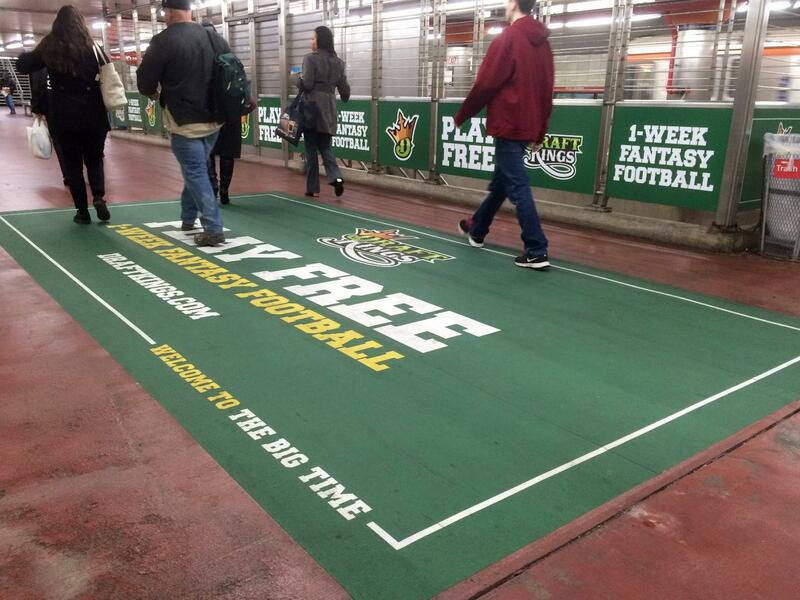 Jason Brodeur once again files legislation to exempt fantasy sports from gambling legislation. “Larry Metz files government accountability bill for 2018” via LobbyTools — Metz, a Yalaha House Republican, for the fifth session is pushing a “government accountability” auditing measure (HB 11). His measure is part of a larger push by the House for good government reforms. The legislation makes a broad range of changes to government auditing provisions, most notably requiring government entities to create internal controls to prevent “fraud, waste and abuse” which the bill attempts to define. This year the bill includes provisions relating to audits of Florida Virtual School Global, which extends to auditing student enrollment records, assets, security and accountability, as well as give specific rules for student eligibility rules to attend a Florida virtual school. Sen. Kelli Stargel, a Lakeland Republican, has filed a similar bill (SB 354). “One bill prohibits assault weapons sales; others loosen gun control” via James Call of the Tallahassee Democrat — Among the 11 bills loaded for lawmakers’ return to Tallahassee is a measure by Sen. Linda Stewart that would prohibit the sale or transfer of assault weapons. 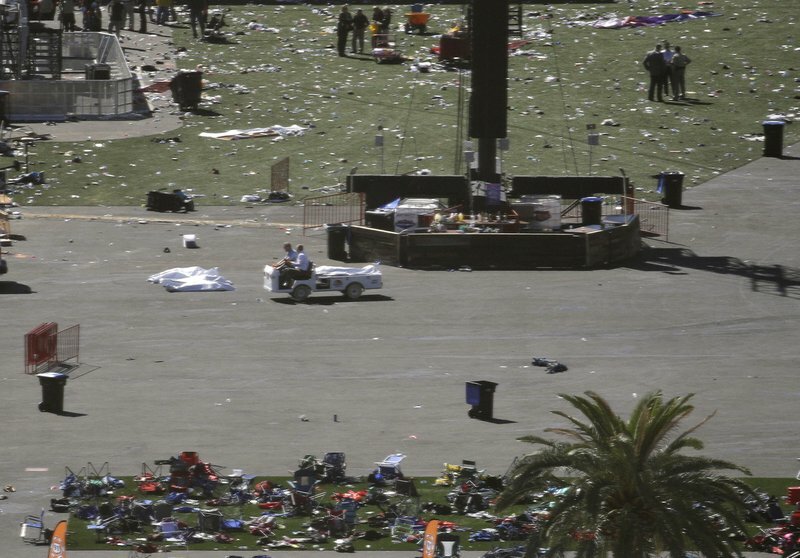 “There is no reason for high-powered assault weapons to be so readily available in a civilized society,” Stewart said the morning after a man carried a stockpile of 20 firearms into a Las Vegas hotel room and rained a barrage of bullets onto an open-air concert below. On the other side, Sen. Greg Steube filed five bills for 2018 to make it easier to get a gun. He chairs the committee that usually handles gun legislation. Stewart’s 23-page bill prohibits the sale or transportation of all AK and AR series firearms, including the AR-15 the Vegas killer is said to have used. In SB 196 is a two-page list of weapons banned from being sold or given away in Florida. Red light cameras are again being targeted for elimination statewide for 2018. 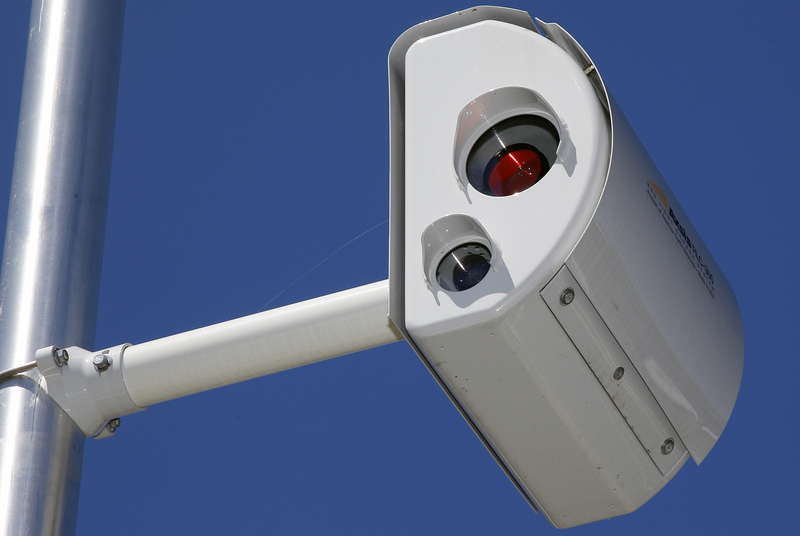 “House could speed toward red-light camera repeal” via the News Service of Florida — The House Appropriations Committee next week is scheduled to take up a bill (HB 6001), filed by Rep. Bryan Avila and Rep. Blaise Ingoglia that would repeal state laws that allow local governments to use red-light cameras in traffic enforcement. The bill has not been assigned to other committees, meaning that approval by the Appropriations Committee could prepare it to go to the full House when the 2018 session starts in January. Sen. Travis Hutson has filed a repeal bill (SB 176) for the 2018 session. That bill has been assigned to four Senate committees. “Two days before execution date, death row inmate speaks out” via Steve Bousquet of the Tampa Bay Times — Michael Lambrix decided he won’t go quietly. For an hour at Florida State Prison, the convicted murderer talked about life and death, his last meal and upcoming funeral, and criticized a court system that he has long insisted would not consider evidence that would spare his life in the killings of Clarence Moore and Aleisha Bryant in 1983. “It won‘t be an execution,” Lambrix told reporters. “It’s going to be an act of coldblooded murder.” Lambrix said he killed Moore in self-defense after Moore killed Bryant during a long night of drinking near LaBelle. He was convicted largely on the testimony of a friend, Frances Smith, who was with him that night. They borrowed a neighbor’s shovel and he buried both victims. Lambrix had walked away from a prison work-release program and said he didn’t report the killings to police because he knew he faced a long sentence for his escape. Lambrix has been on death row for nearly 34 years. Prison rules allow for a condemned inmate to hold a news conference or group interview before execution, but most do not. Lambrix went on a hunger strike last month to protest his death sentence but ended it after 12 days. He said his final meal would be a Thanksgiving-style turkey dinner, which is what his mother promised to cook if he was exonerated. “Report: Florida could offer sports betting in seven years” via The Associated Press — Legal sports betting could be offered in 32 states within five years if the U.S. Supreme Court rules in favor of New Jersey’s quest to provide such gambling … Eilers & Krejcik Gaming, LLC, which tracks state-by-state gambling legislation, says a new market would be worth more than $6 billion. 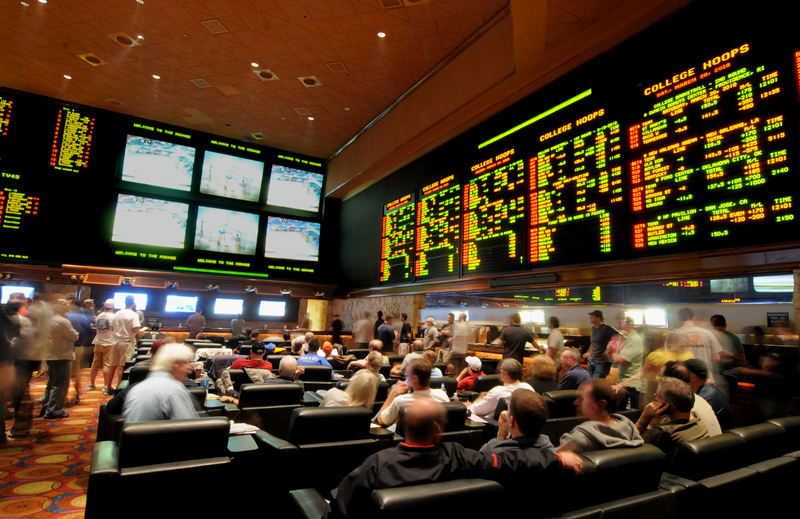 If all 50 states got on board, legal sports betting could be worth $7.1 to $15.8 billion, they estimate. Americans are already betting up to $60 billion annually using offshore sites and bookies, said Chris Grove, managing director for the firm. It’s an industry that generates some $3 billion in revenue each year from U.S. customers. Sports betting could be legal in 32 states, including Florida, within seven years if the SCOTUS approves New Jersey’s quest. “Martin County ‘water farm’ expanded” via Florida Politics — Caulkins Citrus Co. launched the expansion of its Indiantown “water farm,” increasing the reservoir from an existing 413 acres to 3,200 acres, the company announced in a news release Tuesday. “The expansion of the facility was completed in just nine months,” the statement said. “The additional acres will now allow the water farm to store up to 35 billion gallons of water per year from the C-44 Canal.” “It is gratifying to see this property, which was once a thriving citrus grove, now being used to protect and preserve Martin County’s estuaries from damaging discharges,” said George Caulkins, president of the company, in a statement. “Gary F. Clark sworn in as Public Service Commissioner” via Florida Politics — Clark was sworn in Tuesday as the newest member of the Florida Public Service Commission, which regulates investor-owned utilities. Circuit Judge Colby Peel did the swearing in. Gov. Rick Scott appointed Clark to the PSC in September to serve the remainder of former Commissioner Jimmy Patronis’ four-year term. Patronis stepped down earlier this year to become the state’s CFO. Clark was most recently Deputy Secretary of Land and Recreation for the Florida Department of Environmental Protection (DEP). “Ballard Partners forms strategic alliance with European lobbying firm Alber & Geiger” via Florida Politics — Ballard Partners, the Florida-based government affairs firm with strong ties to President Donald Trump, has formed an international strategic alliance with Alber & Geiger, a political lobbying powerhouse in the European Union, in efforts to leverage both firms’ governmental expertise in their respective countries. Ballard Partners is led by Brian Ballard, an early supporter of Trump who is also a regional vice chair of the Republican National Committee, where he helps leads the party’s fundraising. In January, Ballard opened a Washington outpost of his lobbying operation and staffed it with a team with extensive ties to Trump and Republican-controlled D.C.
“Personnel note: James Kotas exiting FCCI for role with Darden restaurant chain” via Michael Moline of Florida Politics — … a national restaurant chain with brands that include The Capital Grille, LongHorn Steakhouse and Olive Garden. He becomes manager of state and local government relations for 23 eastern states. The department will comprise three employees, including Kotas’ counterpart on the West Coast. “It was a job opportunity that was too hard to turn down,” Kotas said. Wilbur Smith attorneys, PINK for Breast Cancer Awareness Month — Fort Myers-based Wilbur Smith Attorneys at Law launched their second annual PINK-out in honor of Breast Cancer Awareness for October. “Our team is proud to once again display our support of a cause that affects nearly each and every family in our community and does our part to bring awareness each year throughout the official month,” said Managing Partner Sawyer Smith. Throughout October, Wilbur Smith overhauls the firm’s branding with the official breast cancer awareness color; everything in PINK! The Wilbur Smith logo will again feature an incorporated pink awareness ribbon. From business cards to billboards across town Wilbur Smith will display the colors in support of the monthlong international health campaign. “Are the spires on Disney World’s Cinderella Castle removable in case of hurricane?” via Snopes.com — While Florida was ramping up preparations for the arrival of devastating Hurricane Irma in early September 2017, a rumor spread that construction crews at Walt Disney World in Orlando were hard at work detaching the spires from the Magic Kingdom’s most iconic structure, Cinderella Castle, to prevent storm damage. It was strange because it seemed to confirm a decades-old, long-since-debunked urban legend that the Cinderella Castle was designed and built such that all or part of it can be quickly “dismantled” in the event of an approaching hurricane. Disney officials say that isn’t true. When the website of the British newspaper The Guardian reported that Walt Disney World would close its doors on Sept. 10, 2017, in advance of Hurricane Irma, the article included an embedded tweet noting that Cinderella Castle’s spires were being removed to spare them from the storm, complete with an alleged photo of the project. We traced the photo of the crane supposedly detaching Cinderella Castle’s spires to a February 2016 blog post documenting the removal of Christmas lights. “Disney confirms that it looked at buying Twitter last year but went with BAMTech instead” via Alex Heath of Business Insider – Disney looked at acquiring Twitter last year but decided to buy video streaming firm BAMTech instead, CEO Bob Iger said onstage at Vanity Fair’s New Establishment conference … “We thought Twitter had global reach,” Iger said, adding that Disney’s interest wasn’t “about social media” but rather “distribution” for Disney content. Reports from last year said that Disney decided to back down because of rampant bullying and so-called troll activity on Twitter’s platform, and Tuesday’s comment from Iger marked Disney’s first public confirmation that it looked at an acquisition. “The new reality of old age in America” via Mary Jordan and Kevin Sullivan of The Washington Post — People are living longer, more expensive lives, often without much of a safety net. As a result, record numbers of Americans older than 65 are working — now nearly 1 in 5. That proportion has risen steadily over the past decade, and at a far faster rate than any other age group. Today, 9 million senior citizens work, compared with 4 million in 2000. While some work by choice rather than need, millions of others are entering their golden years with alarmingly fragile finances. Fundamental changes in the U.S. retirement system have shifted responsibility for saving from the employer to the worker, exacerbating the nation’s rich-poor divide. Two recent recessions devastated personal savings. And at a time when 10,000 baby boomers are turning 65 every day, Social Security benefits have lost about a third of their purchasing power since 2000. Polls show that most older people are more worried about running out of money than dying. 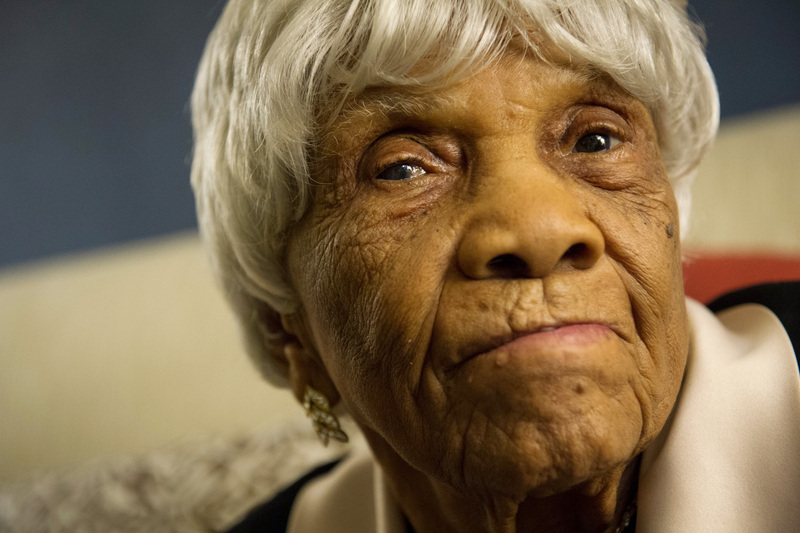 102-year-old Desiline Victor, a native of Haiti, and resident of Miami, waited in line for hours to vote on election day in November 2012, despite her age. Photo via Rod Lamkey Jr./MCT. Rest in peace — “Woman who earned praise from Barack Obama after waiting in line for hours to vote dies at 106” via Carli Teproff of the Miami Herald — After standing in line for several hours to vote in the 2012 presidential election, Desiline Victor got the surprise of a lifetime. The then-102-year-old from North Miami was invited to sit in the first lady’s box as former President Obama delivered his State of the Union address. “We should follow the example of a North Miami woman named Desiline Victor,” Obama said during his Feb. 12, 2013, speech. “When Desiline arrived at her polling place, she was told to wait to vote, might be six hours. As time ticked by her concern was not with her tired body or aching feet, but whether folks like her would get to have their say. Hour after hour, a throng of people stayed in line in support of her. Because Desiline is 102 years old. And they erupted in cheers when she finally put on a sticker that read, ‘I Voted.’” Victor, known as “Granny,” became a local celebrity, encouraging others to vote and inspiring a foundation named after her that focuses on voter education. After shaking her godson’s hand, as a way of saying goodbye, Victor died Sept. 24. She was 106.